Identical twins Tommy and Coop love pulling pranks. They also love to skateboard. So when their skateboarding idol comes to town they are super excited. First prize in the skateboarding competition is the chance to meet Jed Michaels and be on his TV show. The twins will do anything to win. 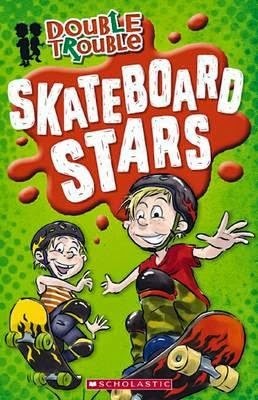 Skateboard Stars combines the twins’ talents for skateboarding and pranking in a funny story about skills and spills in a skateboard half-pipe park. Written specifically for boys, there is no doubt they will love the action and competitive nature of the skateboard competition and the increasing difficulties of the tricks the riders need to show. They will understand the language of the skate park and appreciate the humour and cheekiness of the stunts pulled. The black and white illustrations, some full page, split the text making the reading seem less daunting, but also add to the humour story. The Double Trouble series is pitched to the male 5+ readership. Easy words, large text, short chapters combine to make this a very readable series for beginners. And the funny pictures, cheeky stunts and sporting action will ensure young readers return to this series for more.